Librarians often use presentation slides to teach a class, run a workshop, or give a talk. Ideally you should be able to access the Internet easily at those places. But more often than not, you may find only spotty Internet signals. If you had planned on using your presentation slides stored in the cloud, no access to the Internet would mean no slides for your presentation. But it doesn’t have to be that way. In this post, we will show you how to locally save your presentation slides on your iPad, so that you will be fully prepared to present without Internet access. You will only need a few tools, and the best of all, those tools are all freely available. If your presentation slides do not require a lot of text, Haiku Deck is a nice iPad app for creating a complete set of slides without a computer. The Haiku Deck app allows you to create colorful presentation slides quickly by searching and browsing a number of CC-licensed images and photographs in Flickr and to add a few words to each slide. Once you select the images, Haiku Deck does the rest of work, inserting the references to each Flickr image you chose and creating a nice set of presentation slides. You can play and present these slides directly from your iPad. Since Haiku Deck stores these slides locally, you need access to the Internet only while you are creating the slides using the images in Flickr through Haiku Deck. For presenting already-made slides, you do not need to be connected to the Internet. 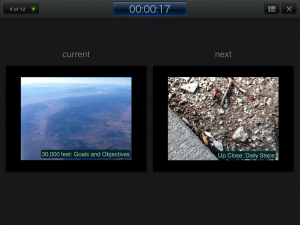 If you would like, you can also export the result as a PowerPoint file from Haiku Deck. This is useful if you want to make further changes to the slides using other software on your computer. But bear in mind that once exported as a PowerPoint file, the texts you placed using Haiku Deck are no longer editable. 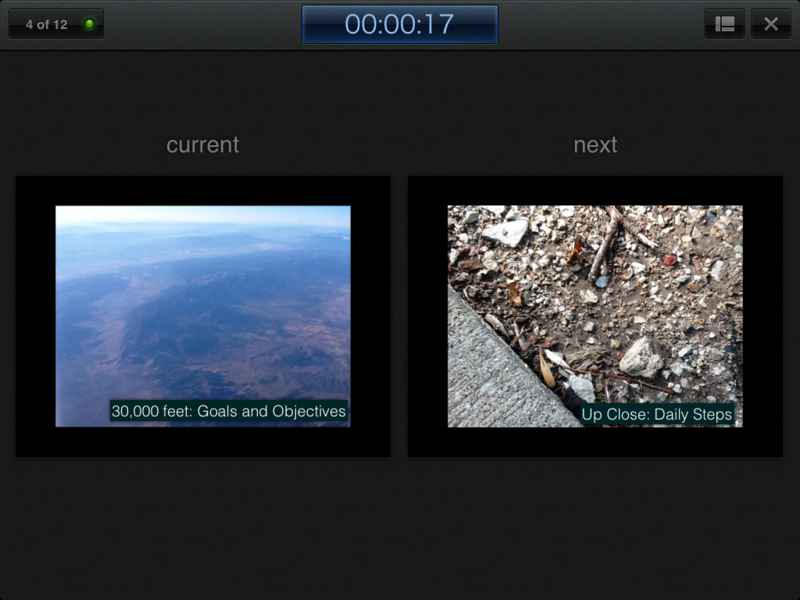 Below is an example that shows you how the slides made with Haiku Deck look like. Note. Click the image itself in order to see the bigger version. So next time when you get a last-minute instruction request from a teaching faculty member, consider spending 10-15 minutes to create a colorful and eye-catching set of slides with minimal text to have it accompany your classroom instruction or a short presentation all on your iPad. SlideShark is a tool not so much for creating slides as for displaying the slides properly on the iPad (and also for the iPhone). 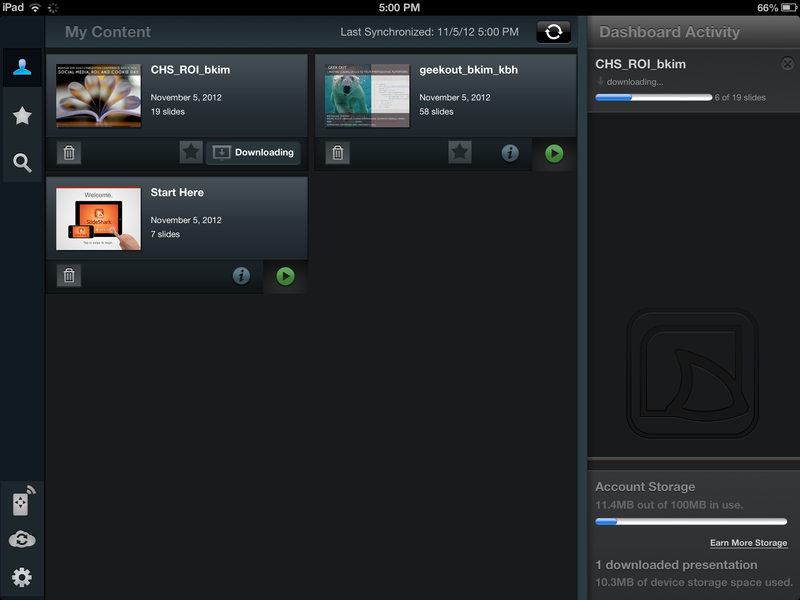 In order to use SlideShark, you need to install the SlideShark app on your iPad first and then create an account. Once this is done, you can go to the SlideShark website (https://www.slideshark.com/) and log in. Here you can upload your presentation files in the MS PowerPoint format. Once the file is uploaded to the SlideShark website, open the SlideShark app on your iPad and sync your app with the website by pressing the sync icon on top. 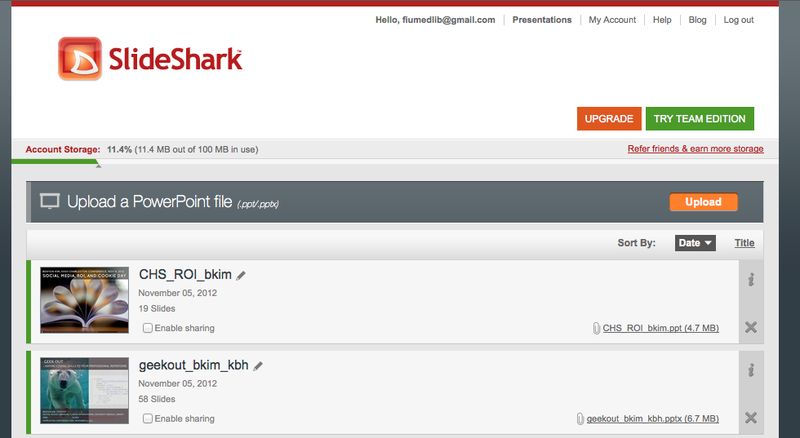 This will display all the presentation files that have been uploaded to your SlideShark website account. Here, you can download and save a local copy of your presentation on your iPad. You will need the live Internet connection for this task. But once your presentation file is downloaded onto your SlideShark iPad app, you no longer need to be online in order to display and project those slides. While you are using your iPad to display your slides, you can also place your finger on the iPad screen which will be displayed on the projector as a laser pointer mark. SlideShark also recently added the integration option with a user’s Dropbox or Box account and the support for playing the embedded video in a PowerPoint file. Haiku Deck and SlideShark are both free. But if you are willing to invest about ten dollars for convenience, another great presentation app is Keynote (currently $9.99 in Apple Store). While Haiku Deck is most useful for creating simple slides with a little bit of text, Keynote allows you to create more complicated slides on your iPad. 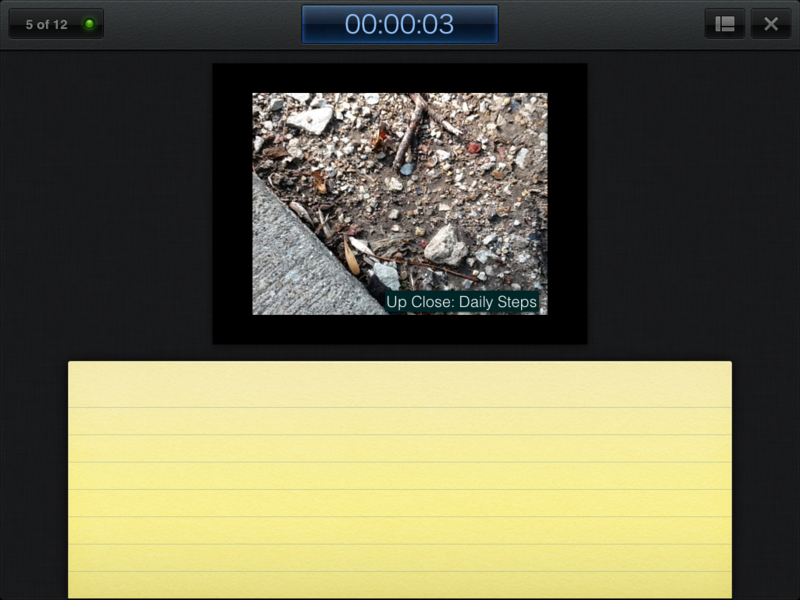 If you use Keynote, you also don’t have to go through SlideShark for the off-line display of your presentation slides. Creating presentations on the Keynote iPad app is simple and uses the same conventions and user-interface as the familiar Keynote application for OS X. Both versions of Keynote can share the same presentation files, although care should be taken to use 1024 x 768 screen resolution and standard Apple fonts and slide templates. iCloud may be used to sync presentations between iPads and other computers and users can download presentations to the iPad and present without Internet access. The iPad version of Keynote has many features that make Keynote loved by its users. You can add media, tables, charts, and shapes into your presentation. Using Keynote, you can also display your slides to the audience on the attached projector while you view the same slides with a timer and notes on your iPad. (See the screenshots below.) For those with an iPhone or iPod Touch, the Keynote Remote app allows presenters to remotely control their slideshows without the need to stand at the podium or physically touch the iPad to advance their slides. Do you have any useful tips for creating slides and presenting with an iPad? Share your ideas in the comments!